Digital sketch done with the chalk tool in ArtRage Studio Pro. Thanks to everyone for your comments! I am thinking of finishing my SketchFest pieces and making them available as prints from Imagekind. Please let me know here if that would interest you! Ellen Million says: Mwahahahahaha!! Oh, that's hilarious. :)	~ Reply? mikka says: Bwahah! 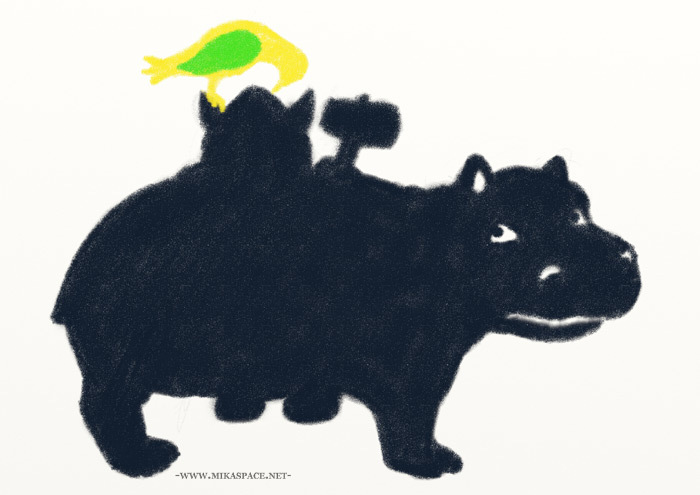 The poor hippo must have quite the tummyache, but the bird seems to like the higher perch. ~ Reply? Jenny Heidewald says: "Hmm, maybe it was something that I ate?" :D	~ Reply? P. Benisch says: Hihihihihihi. So funny that one can also recognize his hammer. ~ Reply? Coriander Shea Detwiler says: This is hilarious! :)	~ Reply? Noreen says: omigod.. I laughed so much, I think snorted. ~ Reply?